The cedar and palm trees along Highway 99 as seen via Google Maps. 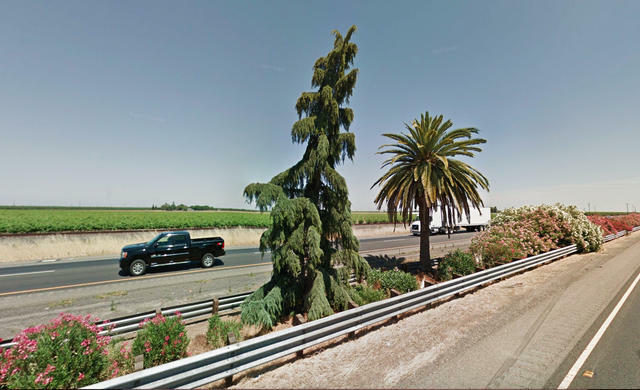 1On Highway 99 between Merced and Fresno, a peculiar pairing of trees rises from the center median. A palm tree and a cedar tree stand side by side, like companions, the only two trees along a stretch otherwise filled with oleander shrubs. No plaque or roadside viewing area marks the spot. Visitors catch only a glimpse as they drive by. Yet locals have embraced the trees as a cultural treasure. In the 1980s, Cal Trans proposed removing them for some road improvements, prompting an outcry. The trees stayed. The Southern Pacific Railroad built the Tehachapi Loop in the 19th century. 2It's the stuff of dreams for a child with a toy train set. 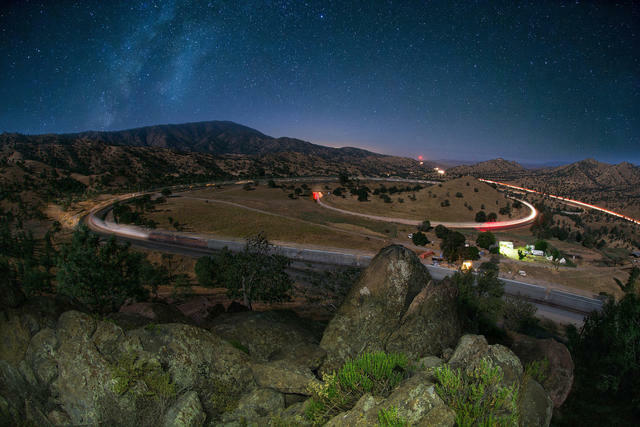 In the Tehachapi Mountains near Bakersfield, a railway line makes a full 360-degree loop. Zigzagging usually suffices to navigate tricky terrain. But engineers trying to cut a path through the range between Bakersfield and Mojave, about 50 miles away, confronted a particularly steep section. The Tehachapi Loop allows trains to spiral upward for nearly three-quarters of a mile, gaining 77 feet in elevation. 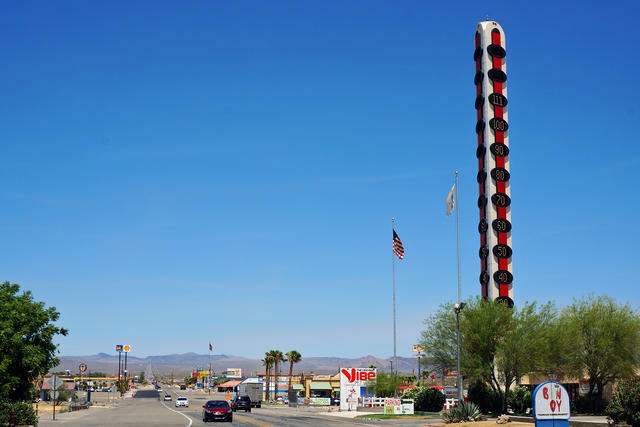 The world's tallest thermometer rises from a desert pit stop along Interstate 15. 3It's a question we've all asked ourselves: Where is the world's largest thermometer? Standing 134 feet, the roadside oddity rises along Interstate 15 in the tiny Mojave Desert town of Baker. It was the brainchild of Willis Herron, a local businessman who dropped $700,000 to build the working thermometer next to his Bun Boy Restaurant in 1991. The height commemorates the hottest atmospheric temperature ever recorded: 134°F at nearby Death Valley in 1913. Years ago, Herron told the L.A. Times that the idea for the thermometer came to him upon hearing people make remarks about the summer heat. They'd say, "'Whew! It's hotter 'n hell. How hot is it anyway?'" The Boudin shop after moving to a location on Broadway in 1890. The business burned in 1906. 4At a San Francisco bakery, each bread loaf has a trace of the Gold Rush. 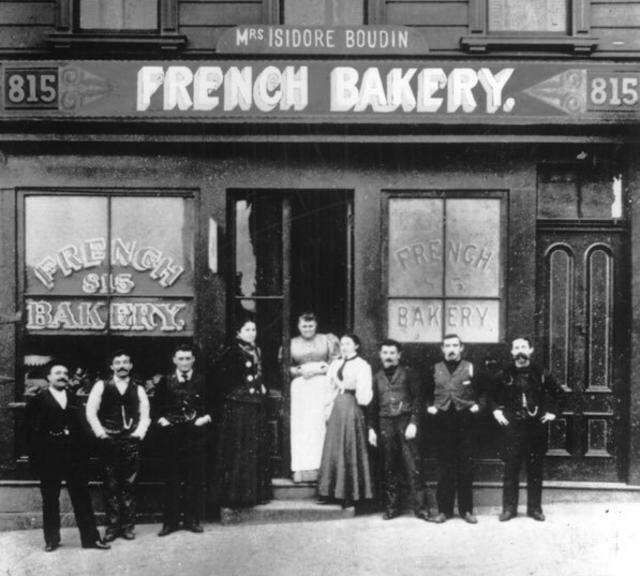 Boudin Bakery was opened in 1849 by a Frenchman named Isidore Boudin. As the story goes, a gold miner loaned him a spoonful of sourdough starter — a fermented mixture containing yeast and bacteria — which Boudin found produced bread of a tangier sort than that of his homeland. The flavor was credited to a bacterium that thrives only in San Francisco's foggy climate. It's called Lactobacillus sanfranciscensis. Boudin's “Mother Dough” is still used today, kept alive by adding water and flour to the mixture daily. It was once saved from a burning building after the great earthquake of 1906. 5One might expect the most-viewed picture of all time to capture some seminal historical moment. But the strongest candidate appears to be an image of a quaint Napa Valley hillside. 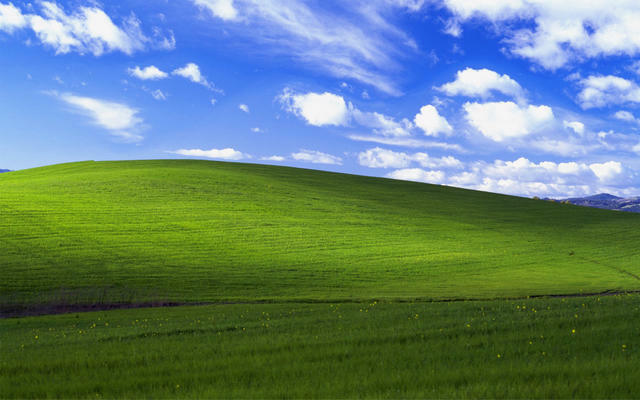 "Bliss," the wallpaper used in Microsoft's Windows XP operating system, has been seen by billions of eyes. It was captured by Charles O'Rear, a St. Helena photographer who spotted a slope of iridescent green set against a blue sky while driving along a country road in 1996. 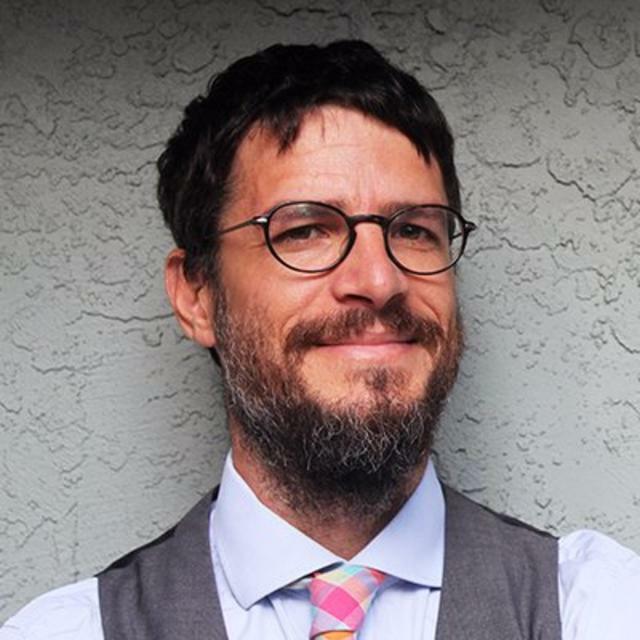 He pulled over and snapped four frames, which he uploaded to his photo agency, Corbis. Microsoft was drawn by the landscape's suggestion of serenity and freedom. For years, "Bliss" was propagated on computer screens around the world — in schools, the White House, Thai villages. 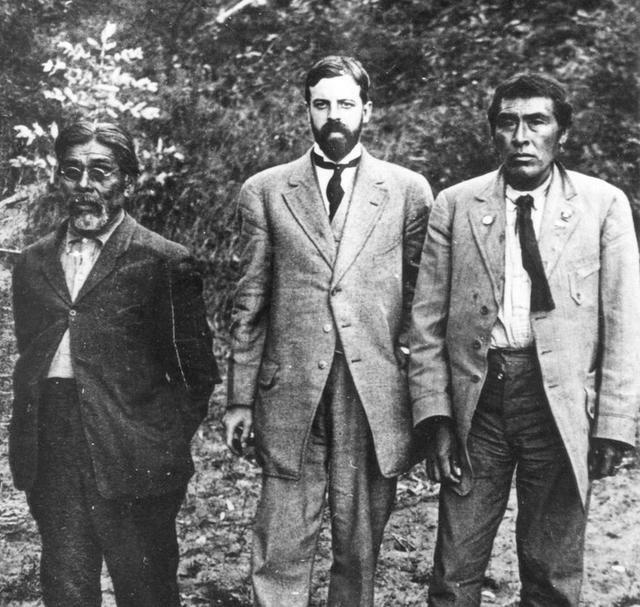 From left, Sam Batwai, a Yahi translator; Alfred Kroeber, an anthropologist; and Ishi in 1911. 6In 1911, a Native American man emerged from the Sierra foothills near Oroville. He was malnourished and terrified. He became known as Ishi, meaning "man," and was believed to be the last living member of the Yahi tribe, which had been wiped out through killing, starvation, and disease during California’s Gold Rush. Dubbed the "last wild Indian," Ishi lived in an apartment at a museum in San Francisco, where his reactions to modern wonders were breathlessly chronicled in the press. After five years, in 1916, he died from tuberculosis at 54. Decades later, his ashes were scattered by a tribal delegation in the Mount Lassen foothills that he called home.